Questions of eternal significance: Wii vs. XBOX? Several months back I asked this question and most people suggested we start with a Wii since the games are more geared to kids. We bought a used Wii system from some friends and we’ve been using it a lot. I’ve limited our usage thus far to Just Dance, Guitar Hero, Wii Sports and Wii Fit. I know there are some other great games for kids but I’ve been trying to avoid the games that use the joystick because I think they will favor them over the more active games, and they are pretty enthusiastic about Just Dance. I also feel like Guitar Hero is helping them learn rhythm and actually complimenting their guitar lessons a bit. So . . . my next step is that I’d like to get the whole Rock Band set-up with the drum kit. I’ve heard that the drum aspect of Rock Band is useful for kids learning to play drums, and I think we would have a lot of fun with it. But it’s a big investment. And I feel like I need to decide whether to invest in the Wii drum kit or the Rock Band drum kit. I’d also like to get a few more versions of Just Dance and I’m wondering if it is more fun with the XBOX Kinnect where you don’t have to hold the remote in your hand. As it stands one of our remotes is perpetually broken and they are perpetually fighting over them. It would be nice to have a remote-free gaming experience. But seriously, for those of you with experience . . . should we stick with the Wii? Or move up to XBOX? I don’t want to buy a lot of accessories for Wii if this move in inevitable. It seems like a lot of the feedback I got last time was to avoid XBOX because of the violent games, but I feel confident that we can avoid them and I want to judge the systems just on their merits alone. This is coming from the mother who has disallowed Mario Cart because it’s not active enough. I am the boss of this house. And also slightly Amish about gaming. Although I do have to swallow my words a bit. 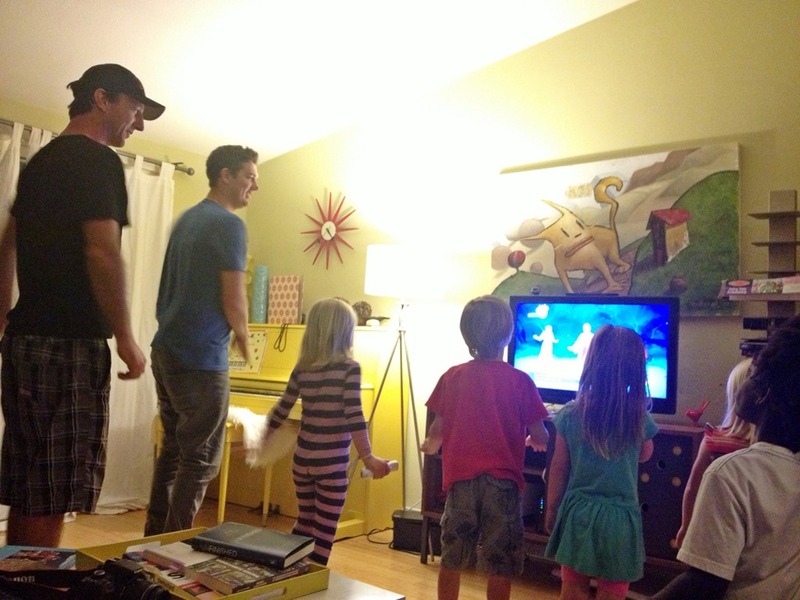 Mark and I have been gaming snobs for a long time, and I must confess: doing Just Dance with the kids at night has become a really fun family experience. We all enjoy it and we are sweating by the end. I think gaming systems are just like other forms of screen time: it’s all about balance, moderation, and content. So, what say you? Stick with the Wii or upgrade and get the drum kit for the XBOX?